Is it possible to assign multiple keyboard shortcuts for same default command. I want to switch between workspaces using CTRL+NUMPAD_1 and using CTRL+1 too. Or how to add custom command for switching? I also found out that the GUI that allows you to assign keybindings is limited in a way that annoys me. The GUI allows exactly ONE keybinding to be assigned to each action. In dconf, you can set an array of bindings for a single action. The keybindings that are handled by the window manager support multiple keys that will perform the same action. The gnome-control-center GUI does not support it, but you can make it work using dconf-editor. 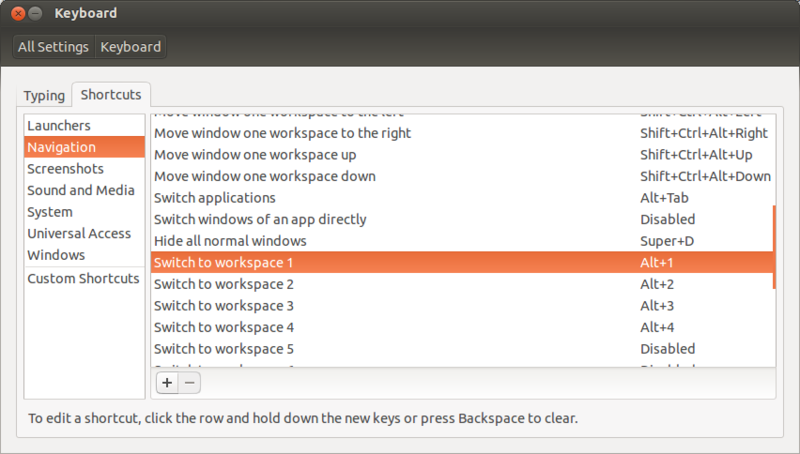 For example to have "Close window" use both the traditional F4 as well as an easier to hit Pause/Break button, change org.gnome.desktop.wm.keybindings close to ['Pause', 'F4']. results in an error for invalid value while wrapping the array in quotes does not trigger an error but assigns no function to any of the keys neither. (I assume Ubuntu 12.04 might not having received an update in this regard). I spent a while looking into this, and unfortunately the answer seems to be "no". Stephen Ostermiller did some excellent research into keyboard shortcuts, which you can read in his answer, here: Where are GNOME keyboard shortcuts stored? As you can see, my preferred shortcuts for switching workspaces are Alt1, etc. The square brackets around the Value led me to think that it might allow an array of values, but I although I was able to change the shortcuts via this value, was unable to get more than one to work. It would only use the first which one I defined. Not the answer you're looking for? Browse other questions tagged shortcut-keys or ask your own question. Where are GNOME keyboard shortcuts stored? How to change command-line keyboard shortcuts?